Gholami, M., Haghshenas, M., Moshiri, M., Razavi, S., Pournajaf, A., Irajian, G., Heidary, M. (2017). Frequency of 16S rRNA Methylase and Aminoglycoside-Modifying Enzyme Genes among Clinical Isolates of Acinetobacter baumannii in Iran. Iranian Journal of Pathology, 12(4), 329-338. Mehrdad Gholami; Mohammadreza Haghshenas; Mona Moshiri; Shbnam Razavi; Abazar Pournajaf; Gholamreza Irajian; Mohsen Heidary. "Frequency of 16S rRNA Methylase and Aminoglycoside-Modifying Enzyme Genes among Clinical Isolates of Acinetobacter baumannii in Iran". Iranian Journal of Pathology, 12, 4, 2017, 329-338. Gholami, M., Haghshenas, M., Moshiri, M., Razavi, S., Pournajaf, A., Irajian, G., Heidary, M. (2017). 'Frequency of 16S rRNA Methylase and Aminoglycoside-Modifying Enzyme Genes among Clinical Isolates of Acinetobacter baumannii in Iran', Iranian Journal of Pathology, 12(4), pp. 329-338. Gholami, M., Haghshenas, M., Moshiri, M., Razavi, S., Pournajaf, A., Irajian, G., Heidary, M. Frequency of 16S rRNA Methylase and Aminoglycoside-Modifying Enzyme Genes among Clinical Isolates of Acinetobacter baumannii in Iran. Iranian Journal of Pathology, 2017; 12(4): 329-338. Background & objective: Multidrug-resistant Acinetobacter baumannii (MDR-AB) is an important nosocomial pathogen which is associated with significant morbidity and mortality, particularly in high-risk populations. Aminoglycoside-modifying enzymes (AMEs) and 16S ribosomal RNA (16S rRNA) methylation are two important mechanisms of resistance to aminoglycosides. The aim of this study was to determine the prevalence of 16S rRNA methylase (armA, rmtA, rmtB, rmtC, and rmtD), and the AME genes [aac(6′)-Ib, aac(3)-I, ant(3′′)-I, aph(3′)-I and aac(6')-Id], among clinical isolates of A. baumannii in Tehran, Iran. Methods: Between November 2015 to July 2016, a total of 110 clinical strains of A. baumannii were isolated from patients in two teaching hospitals in Tehran, Iran. Antimicrobial susceptibility testing was performed according to Clinical and Laboratory Standards Institute guidelines. The presence of genes encoding the AMEs and16S rRNA methylases responsible for resis­tance was investigated by multiplex polymerase chain reaction. Results: The results showed that colistin was an effective antibiotic and could be used as a last-resort treatment of infections caused by MDR-AB. The resistance rate to aminoglycosides were 100%, 96.36% and 90.9% for tobramycin, gentamicin and amikacin, respectively. In this study, AME genes of aac(6′)-Ib, aac(3)-I and ant(3′′)-I were most prevalent among the isolated strains. Conclusion Markedly high resistance to tobramycin, gentamicin and amikacin was noted in current study. Our results suggested that modifying enzyme genes in conjunction with methylation of 16S rRNA might contribute to aminoglycoside resistance induced in vivo in A. baumannii.Further studies are required to determine the prevalence of the aminoglycoside resistance genes in other hospitals of Iran. Multidrug-resistantAcinetobacter baumannii (MDR-AB) have recently emerged as a life-threatening pathogen which is responsible for a variety of healthcare-associated infections (HAIs) and large epidemics in hospitals (1). Due to MDR-strains are resistant to almost all routinely used antimicrobial agents such as; aminoglycosides, fluoroquinolones, tetracyclines, and cephalosporines, they are becoming a major problem in hospitalized patients in hospital environments all around the world (2, 3, 4). Aminoglycosides are broad-spectrum bactericidal antibiotics which are commonly prescribed for the treatment of infections with Gram-negative bacteria (5, 6). In general, aminoglycosides such as tobramycin, gentamicin and amikacin have extensively been used for ttreatment of A.baumannii infections (7, 8). Aminoglycoside-modifying enzymes (AMEs) and 16S ribosomal RNA (16S rRNA) methylation are two important mechanisms for antibiotic inactivation and lead to resistance to multiple aminoglycosides in A. baumannii (9, 10). According to their functions, AMEs are generally categorized to three types: aminoglycoside phosphotransferase (APS), aminoglycoside acetyltransferase (AAC), and aminoglycoside nucleotidyltransferase (ANT). All three types of AMEs have been identified in clinical isolates of Acinetobacter spp. (10). Furthermore, a high number of genes encoding these enzymes are associated with plasmids and transposons, which help in the rapid spreading of antimicrobial resistance through species boundaries. Several AMEs have been recognized in Acinetobacter spp., including variants of phosphotransferases APH(3')-I, APH(3')-II, and APH(3')-VI, the acetyltransferases AAC(3)-I, AAC(3)-II, AAC(3)-III, AAC(6')-I, AAC(6')-II,and AAC(6')-III, and the nucleotidyltransferases ANT(3-)-I,ANT(4')-I,and ANT(2")-I(11,12,13). The aminoglycoside antibiotics bind to the A-position of 16S rRNA in the 30S ribosomal small subunit and interact with protein synthesis. At present, ten types of 16S rRNA methylase genes (armA, rmtA, rmtB, rmtC, rmtD, rmtE, rmtF, rmtG, rmtH and npmA) have been described as another main mechanism of aminoglycoside resistance in A. baumannii. Hence, these genes can simply move to other bacteria since their resistance genes are commonly located on small plasmids (14, 15). As well as, the 16S rRNA methyltransferase genes are important factors in the increasing prevalence of aminoglycoside resistance among A. baumannii strains, the analysis of the acquisition of these genes by clinical isolates is essential for the treatment and prevention of their infections (15). Additionally, the emergence of AMEs and 16S rRNA methylases among A. baumannii strains is a serious global threat for the future of antibacterial chemotherapy. With respect to studies such as, Aliakbarzade et al. (16), Karah et al. (17), and Joshi et al. (18), in this field and also, high dissemination and high prevalence of resistance-related genes, it is important to pay greater attention for choosing the best therapy options for patients and optimizing preventive policies to avoid spreading resistance-encoding genes. Therefore, the aim of this study was to investigate the prevalence of 16S rRNA methylase [armA, rmtA, rmtB, rmtC, and rmtD], and the AME genes [aac(6′)-Ib, aac(3)-I, ant(3′′)-I, aph(3′)-I and aac(6')-Id], among clinical isolates of A. baumannii from Tehran, Iran. All clinical samples which contain Acinetobacter isolates, including both gender, and from all age groups including infants to elderly without considering risk factor were involved in this study. Hence, all duplicated clinical isolates were excluded from this study. All isolates harboring mixed microorganisms (which contains Acinetobacter) were also excluded. The current study was a descriptive cross-sectional study. A total of 110 consecutive non-duplicate strains of A. baumannii were collected from two teaching hospitals between November 2015 to July 2016. These clinical strains were isolated aseptically from wound, tracheal tube, pleural fluid, blood, urine and sputum of hospitalized patients in Milad and Shahid Motahari hospitals, Tehran, Iran. The isolates were identified based on standard bacteriological tests including gram staining, motility, oxidase, methyl red, voges-proskauer, simmon's citrate, urease and grown on MacConkey agar (16). The confirmation was done using the Microgen identification kit (Microgen Bioproducts Co., UK). In addition, all isolates were examined by PCR amplification for the presence of the blaOXA-51-like beta-lactamase gene intrinsic to A. baumannii, according to previously described method (19), and then the isolates were stored at –70°C in glycerol skim milk broth. Antimicrobial susceptibility was performed using Kirby-Bauer disc diffusion method according to the Clinical and Laboratory Standards Institute (CLSI) guidelines (20). The discs and contents which were used were as follows: tetracycline (TE: 10 μg), meropenem (MEM: 10 μg), amikacin (AK: 30 μg), imipenem (IPM: 10 μg), cefotaxime (CTX: 30 μg), ceftriaxone (CRO: 30 μg), piperacillin/tazobactam (PTZ: 100/10 μg), piperacillin (PIP: 100 μg), ceftazidime (CAZ: 30 μg), ciprofloxacin (CIP: 5 μg), cefepime (FEP: 30 μg), trimethoprim-sulfamethoxazole (SXT: 2.5 μg), gentamicin (GEN: 10 μg) and Tobramycin ( TOB: 10 μg) (All purchased from Mast Group, Merseyside, UK). Briefly, a microbial suspen­sion was obtained from overnight cultures. The turbidity of each bacterial suspension was adjusted equivalent to a turbidity of 0.5 McFarland standard and then inoculated onto Mül­ler-Hinton agar plates (Merck, Darmstadt, Germany). The diameter zone of inhibition (mm) around the discs were measured after incubation at 37ºC for 20 - 24 hours. For colistin, amikacin and gentamicin MIC was determined by the broth microdilution protocol according to the CLSI. Antibiotic powders were dissolved in an appropriate solvent according to the manufacturer’s recommendations. MICs for amikacin/gentamicin ranging from 0.25 to 512 μg/ml and 0.25 to 128 μg/ml for colistin, were tested. Each well of a 96-well microtiter plate (Extra Gene-Company) contained a total volume of 100 μL of the antibi­otic dilution and Müller-Hinton broth medium. Then, the 0.5 McFarland suspension was diluted 1:20 to yield 5 × 106 CFU/ml. When 0.01 ml of this suspension was inoculated into the broth, the final test concentration of the bacteria was approximately 5 × 105 CFU/ml. The correct density of the turbidity standard was verified by measuring absor­bance using a spectrophotometer. The microtiter plates were incubated at 37°C for 20-24 hours. The MIC was taken as the lowest concentration of the antibiotic which inhibited the growth of the isolates. The MIC50 and MIC90 of the antibiotics were calculated by MIC that inhibited 50% and 90% of the isolates, respectively. Escherichia coli ATCC 25922 carried out as quality control (QC) strain for all suspectibility testing assays. Genomic DNA was extracted from fresh overnight cultures grown on Luria-Bertani (LB) agar plates (Difco Laboratories, Detroit, Mich.) by the phenol-chloroform method (21). Extracted DNA was resolved in 100 µL of TE buffer (10 mM Tris, 1 mM EDTA [pH 8.0]) plus 10 µL of RNase (Sigma, St. Louis, Mo.) for removal of contaminating RNA. The concentration and quality of the extracted DNA were evaluated using a Nanodrop spectrophotometer (ND-1000; Thermo Scientiﬁc; Wilmington, DE, USA). Purified DNA was aliquoted and preserved at -20°C. The specific primer sequences sets used in this study are listed in Table 1. The Primer Basic Local Alignment Search Tool (NCBI BLAST) software and MFEprimer-2.0 server, a fast thermodynamics-based program, was used for checking PCR primer specificity. To aid recognition in a multiplex format, the length of PCR products were selected so that there was ˷100 bp difference amongst each subgroup. Multiplex-PCR was performed with PCR system (Eppendorf Co., Germany) for detection of AMEs (aac (6′)-Ib, aac (3)-I, ant (3′′)-I, aph (3′)-I, aac (6')-Id) and 16S rRNA methylases (armA, rmtA, rmtB, rmtC, and rmtD) genes. 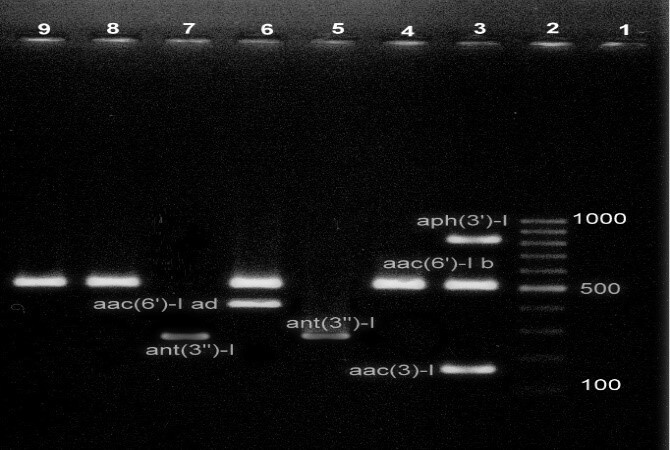 The M-PCR I was undertaken in a final volume of 25 µl containing 2.5 µl of 10X PCR buffer (Thermo Fisher Scientific, Inc.), 2 µl MgCl2 (0.8 mM), 1.5 µl of mixed dNTP (10 μM), 1.5 µl of each the AMEs primer (10 pmol), 1 µl of DNA Taq polymerase (2 U) (Takara Bio, Inc., Dalian, China), 1 μl of template DNA and sterile distilled water. The nucleic acid amplification was performed with the following conditions: 94˚C for 3 minutes, followed by 30 cycles of 94˚C for 50 seconds, 56˚C for 40 seconds and 72˚C for 1 minute and final extension for 6 minutes. The mix for the detection of 16S rRNA methylase genes contained 2 µl of mixed dNTP (10 mM), 2 μl of 10X PCR buffer, 0.4 µl of DNA Taq polymerase (5 U), 1.5 µl MgCl2 (0.8 mM), 1.25 µl of each primer (10 pmol), 1μL of template, DNA and sterile distilled water to a final volume of 25 μl. The M-PCR II assay was performed, using the following parameters: initial denaturation for 1 minute at 95°C, 33 cycles at 94˚C for 45 seconds, 55˚C for 45 seconds, and 72˚C for 1 minute, followed by a final extension during 4 minutes at 72˚C. The PCR products were electrophoresed (Bio Rad, USA) in 1.5% (W/V) agarose gels (SinaClon, Iran) in TAE buffer (0.04 M Tris-acetate, 0.001 M EDTA [pH 8.2]) for 60 minutes at 120 V. Gels were stained with 2 μg/ml ethidium bromide (EtBr) and visualized by irradiation with UV light. Amplicons were identified by estimation of their lengths (in base pairs) using a DNA ladder (Fermentase, CA).Positive and negative controls were included with each reaction. Ethical approval was not needed for the survey, since there was no direct patient involvement and only bacterial isolates were retrospectively studied. Additionally, all clinical samples were unidentified and no recognizable patient information was available. Overall, 51 (46.36%) and 59 (53.63%) strains were collected from Shahid Motahari and Milad hospitals respectively. All 110 A. baumanni isolates had positive results for blaOXA-51-like gene. These strains were mostly isolated from wound samples (n=51, 46.36%), followed by tracheal tube (n=37, 33.63). The other samples were isolated from pleural fluid (n=8, 7.27%), blood (n=8, 7.27%), urine (n=4, 3.63%), and sputum (n=2, 1.81%). Seventy-one (64.5%) strains were isolated from male patients and 39 (35.45 %) from female patients. The patients infected with MDR-AB ranged in age from 17 to 100 years and the average age of patients was 52 +/- 17 years (Mean +/- SD). In the current study, colistin exhibited good activity against the MDR-AB strains (MIC50, 0.5 μg/mL, and MIC90, 1 μg/ml). Also, according to antibiotics susceptibility testing by disc diffusion, all isolates of A. baumannii were defined as MDR and resistant to almost all available antibiotics (Table 2). The Acinetobacter isolate was specified as MDR if it was resistant to at least 3 classes of antibiotics (24). The rate of resistance to aminoglycosides was as fol­lows; tobramycin 100%, gentamicin 96.36%, and amikacin 90.9%. The MIC50 and MIC90 of gentamicin was determined as 128 μg/ml and 512 μg/ml, respectively and MIC50 and MIC90 of amikacin was determined >128 μg/ml. High MIC values would also predict the limited efficacy of those antibiotics against MDR-AB infections. The frequency of aac(6′)-Ib, aac(3)-I, ant(3′′)-I, aph(3′)-I and aac(6')-Id genes were 75.45% (83/110), 69.09% (76/110), 57.27% (63/110), 38.18% (42/110) and 1.81% (2/110), respectively. Furthermore, armA and rmtA genes were detected in 26.36% (29/110) and 2.72% (3/110) of the strains repectively. However, none of the strains carried rmtB, rmtC, and rmtD genes. 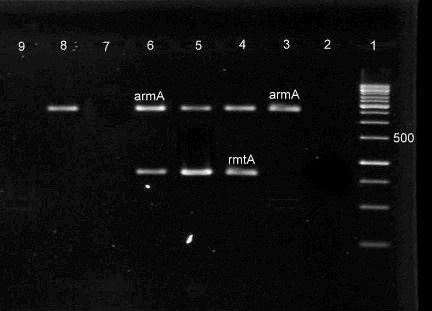 Figures 1 and 2 show the agarose gel electrophoresis MPCR-amplified products of AMEs and 16S rRNA methylase genes, respectively. Coexistence of aminoglycoside resistance genes among the isolatesare shown in Table 3. A. baumannii is a ubiquitous opportunistic pathogen that is especially successful at colonizing and persisting in hospital environments (25). Emerging importance of MDR-AB critically ill patients and their capacity to be more resistant to antimicrobial agents necessitates immediate action (4, 25). In spite of the emergence of new antibiotics, aminoglycosides are still used in combination with β-lactams for treatment of MDR-AB infections in hospitalized patients (26). The results of the current study showed that all tested isolates were significantly resistant to most accessible treatment options such as gentamicin (96.36%) and amikacin (90.9%). This rate of antibiotic resistance in developing countries has increased significantly compared to developed countries during the recent years (27, 28). This may be due to antibiotic stewardship programs and infection control policies in developed countries. In this study, 100% of the isolates were resistant to tobramycin, trimethoprim-sulfamethoxazole, meropenem, cefotaxime, ceftriaxone, cefepime, ceftazidime, ciprofloxacin, piperacillin/tazobactam and piperacillin. These results were consistent with previous Iranian studies on drug resistance of A. baumannii (29, 30), as well as other countries such as China, Turkey and Pakistan (31, 32, 33). As expected, the most effective antibiotic with appreciable activity against the studied isolates was colistin. In agreement with our data, the results of previous studies in Iran (29, 34, 35) have shown that colistin-based therapy for treatment of diseases caused by MDR-AB had an appropriate clinical manifestation and decreased mortality. Many factors affect the dissemination of antibiotic resistance genes. Although some of Acinetobacter spp., have shown intrinsically resistance to some aminoglycosides, resistance genes have also been found in transposons, plasmids and integrons. The rapid emergence of resistance to aminoglycosides in clinical isolates of Acinetobacter has been linked to their ability to acquire these resistance determinants. A wide range of the aminoglycoside resistance genes have been reported in A. baumannii (36). Several factors such as geographical regions, misuse of antibiotics, and inappropriate prescribing of aminoglycosides can play a significant role in the prevalence of aminoglycoside resistance genes (37). For instance, in Belgium the aac(3)-Ia gene (contribut to the gentamicin and tobramycin resistance) was commonly identified in Acinetobacter strains (38). Additionally, it was shown that the distribution of amikacin resistance among A. baumannii isolated in Spain was correlated with an epidemic strain harboring the aph(3′)-VIa (conferring resistance to kanamycin and neomycin) gene (39). In the current study, MPCR test was used to determine 16S rRNA methylase and AME encoding genes in clinically relevant A. baumannii isolates. Our study shows that the multiplex PCR method is a fast, reliable, and powerful technique for simultaneous detection of multiple factors associated with aminoglycoside-resistance. For epidemiologic analysis, MPCR method may be very helpful than using a conventional PCR for targeting each gene. The results of this study are consistent with those reported by Dillon et al. (40) and Poirel et al. (41) and show that the MPCR is a suitable and fast diagnostic application for the management and screening of genes that confer resistance to antibiotics. Our findings indicate that the aac(6′)-Ib, aac(3)-I, aph(3′)-I, and armA genes are more prevalent than other genes; aac(6')-Id and rmtA genes were found only at a very low incidence in our tested isolates. In a study conducted by Wen JT et al. in China, the prevalence of genes encoding aac(3')-I, aac(6')-Ib, ant(3'')-I, and aph(3')-I were 90%, 90%, 85%, and 35.0%, respectively, although other types of 16S rRNA methylase including rmtA, rmtB, rmtC, rmtD and armA were not detected among the MDR-AB isolates (22). A study conducted by Xiao et al. on A. baumannii isolates showed that the prevalence of aac(3)-I, aac(6ʹ)-Ib, ant(2ʺ)-I, and aph(3')-I genes were 10.7%, 17.9%, 14.3%, and 17.9%, respectively, and except armA (17.9%), other types of 16S rRNA methylase genes were not detected in any of the isolates (31). Aliakbarzade et al. (16) reported among the 103 A. baumannii isolates in Tabriz (Northwest Iran), 65.11 % and 60.46 % were positive for aacC1 and aph(3')-VIa, respectively. However in another study performed by Moniri et al. in Kashan (Isfahan Province, Iran) the frequency of aph(3')-VIa, aac(3)-Ia, ant(3')-Ia and ant(2")-Ia genes were 65%, 63.3%, 41.7%, and 3.3%, respectively (42). The 16S rRNA methylases could confer high-level resistance to aminoglycosides (15). In our study, armA was the most prevalent 16S rRNA methylase gene (26.36%), which is in concordance with reports of Vajihe Sheikhalizadeh et al. (44). This gene could be moved to other bacteria by conjugation and conferred high-level resistance to kanamycin, tobramycin, amikacin and gentamicin. These results exhibited that clinical isolates of Acinetobacter in different regions, harboring various types of aminoglycoside resistance genes and coexistence of resistance genes could be found in MDR-AB. In conclusion, the current study revealed that high prevalence of aminoglycoside resistance genes among MDR-AB isolates may be associated with AMEs genes, and 16S rRNA methylase genes were not prevalent in the tested isolates. The other mechanisms of resistance to aminoglycosides such as efflux pumps in MDR-AB strains should be considered in further investigations. Finally, paying attention to the recommended guidelines and implementing infection control policies to decrease the rate of MDR strains must be prioritized in therapeutic centers. The authors are thankful to the staff of the Department of Microbiology, Iran University of Medical Sciences. The assistance of the staff of Shahid Motahari Burns Hospital and Milad Hospital of Tehran, Iran is appreciated.